Steep yourself in Judaism and Moorish Revival architecture at Dohány Street Synagogue, the largest synagogue in Europe, which can seat 3,000 people. Viennese architect Ludwig Forster built the structure between 1854 and 1859 using Islamic influences typical of North Africa and medieval Spain. The synagogue experienced significant destruction during Nazi occupation, when it was bombed and used as a German radio base and stable. However, it was restored to its original design during reconstruction in 1991 and 1998. Visit the site's Heroes' Temple, Jewish Museum, Jewish Cemetery, and Raoul Wallenberg Holocaust Memorial Park. Step inside to see the synagogue's spectacular interior, famous for the colorful, geometric frescoes designed by Hungarian architect Frigyes Feszl. 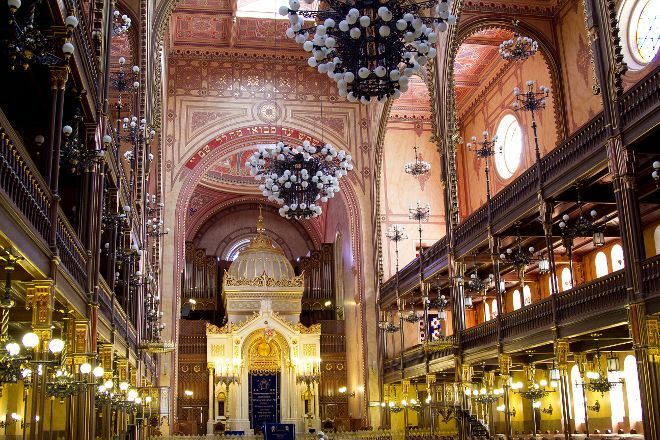 To visit Dohány Street Synagogue and get the most from your holiday in Budapest, create itinerary details personal to you using our Budapest online day trip planner . From outside, it seems to be a very nice, huge Jewish church - called Synagogue - and that in good condition. In this ensemble is placed the Synagogue, a Museum, a Cemetery, the Freedom Tree and so on. But, I think, the entrance fee of 4.000,- Ft/Adult (2018) is definitely too high. A synagogue in Budapest is a great step and considering the level of anti Semitic emotions which was existed, this monument is a great example of modern day tolerance and also a reminder for humans to get in connection to the past and diversity. Beautiful and lovely structure. Negative from my point of view was the entrance fee. I can understand if one has to pay to go and visit the towers and museums inside but paying 13€ per person was a bit too much in my point of view. I didn’t go inside but I am sure there are other enthusiastic tourists who will still be ther. Perhaps I will make my visit there next time when I am in Budapest. A wonderful experience. The tour is very good. You see the inside of the big synagogue, learn about the history of the buildings and the events of WWII and see several, very moving memorials. Don't skip the museum. It has some very interesting artifacts. Beautiful building, very interesting history. You get a tour guide in basically any language. Art show in the basement and interesting sculptures in the back yard. One of Europe's most spectacular synagogues. Well worth a visit. Leave time for the cemetery and museum! Every day, we help thousands of travelers plan great vacations. Here are some tips on how to use your Listing Page to attract more travelers to your business - Dohány Street Synagogue. Promote your permanent link - https://www.inspirock.com/hungary/budapest/dohany-street-synagogue-a410520339 - on your website, your blog, and social media. When a traveler builds a plan from this page, the itinerary automatically includes Dohány Street Synagogue. This is a great way for travelers looking for a great vacation in your city or country to also experience Dohány Street Synagogue. Promoting your link also lets your audience know that you are featured on a rapidly growing travel site. In addition, the more this page is used, the more we will promote Dohány Street Synagogue to other Inspirock users. For best results, use the customized Trip Planning Widget for Dohány Street Synagogue on your website. It has all the advantages mentioned above, plus users to your site can conveniently access it directly on your site. Visitors to your site will appreciate you offering them help with planning their vacation. Setting this up takes just a few minutes - Click here for instructions.